Installing Exchange 2016 on Windows Server 2016 the basics. After Exchange 2016 came out I wanted to try it out, so I already downloaded the ISO. Then I had no more time to install Exchange 2016 and the installation waited longer than expected. The Exchange readiness indicated that the Server-Gui-Mgmt-Infra feature was not installed. Install-WindowsFeature : ArgumentNotValid: The role, role service, or feature name is not valid: ‘Server-Gui-Mgmt-Infra’. The name was not found. The first thing I did was a Google Search. Fortunately, or unfortunately I found the “solution” very quickly. Unfortunately, Exchange 2013 will not be supported on Windows Server 2016 at all. Exchange 2016 will be supported on Windows Server 2016 at GA, however Exchange 2016 it is not guaranteed to work on TP5. Sorry for the inconvenience. So, I’m just going to keep this short. The standard ISO of Exchange does not offer what newer CUs do offer. It is best to download and install the latest CU directly. You can find the CU on technet. Go to the download page directly here. See below. This time Exchange got through the readiness check. I have updated the post in response to feedback. The link to the Exchange CU3 was a direct link. Meanwhile, there is a CU9 out. From now on the link will go to the CU website. Do you have any more feedback or additions to this post? Please leave a comment. 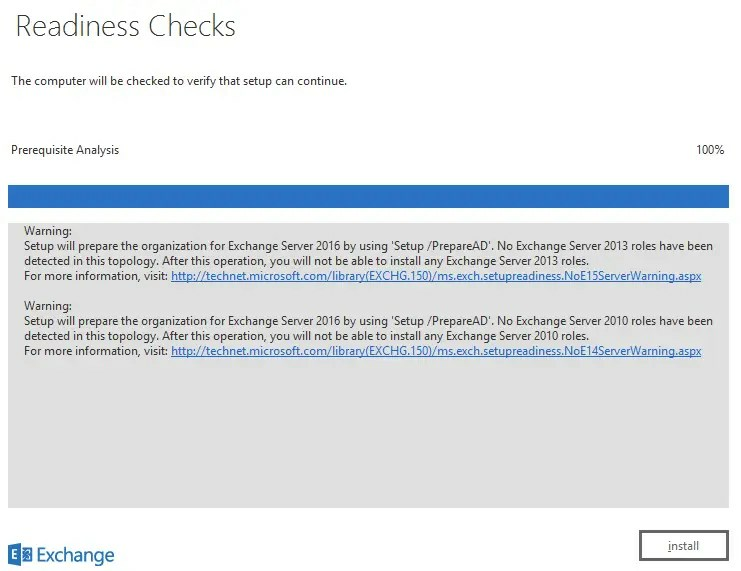 For a complete guide to install Exchange 2016 you can follow the tutorial from Technet.